I suppose “celebrate” is too strong a word. At my advanced age (58!! OMG! ), all I could muster was an acknowledgement that another year had passed all too quickly (impossible to ignore, thanks to Facebook and dozens of birthday greetings from friends and acquaintances, which I have to admit: I do enjoy). I went out to lunch with my friend, Marsha and a rare weeknight dinner with my daughter, who paid for it with a $50 bill my husband had slipped her. My husband’s romantic birthday greeting. What can I say? We have never been mushy poetry people — we’ve always preferred to go for the joke. 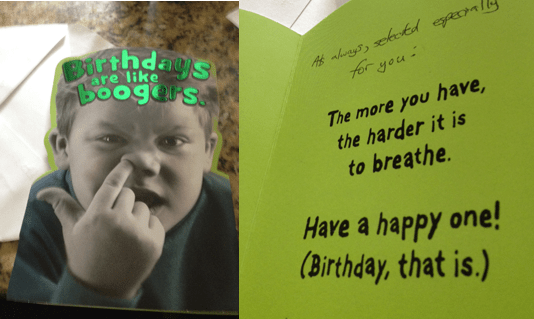 But I have to admit that this card grossed me out a little. Maybe next year I might welcome a few hearts with my flowers. But an unexciting birthday turned out to be a refreshing respite from the day that preceded it. Over the weekend, my Volvo had a close encounter with a parking lot post. So Monday morning began with an appointment at the insurance adjuster’s. I should count myself lucky: The two cases that preceded me were accidents where the car got totaled. All I was dealing with was a dented door and door jamb (or whatever you call that bit of the car below the door). But the complexity of the earlier appointments meant that the adjuster was running late, and I spent a lot longer time there than I had planned. By the time I finished with the adjuster, dropped the car off at the body shop and picked up a rental, it was already lunch time. And I was late to another appointment. As I gathered my things to inspect my rental, the agent informed me that there was only an eighth of a tank of gas. “We’ll mark it as empty, so feel free to return it that way,” he said. Great. I had to buy gas. Another delay. I was near Costco, so filled up there – and noticed that the tire pressure light was on. I don’t know about you: But I always resist getting upsold at car rental agencies. I have auto insurance and have supplemental insurance when I use my American Express card to rent, so I’m covered. But I still get a nagging feeling every time I initial all the spots on the rental agreement indicating that I refused to pay an extra insurance fee… and that idiot tire pressure light was giving me visions of having to pay out of my own pocket for a tire blow-out. So I checked the car, determined that the driver’s side front tire was the low one and pulled up to the air dispenser. The tire pressure light would not go out. I decided to get back out and try some more – and promptly locked myself out of the rental car, with the key in the ignition. This would not have happened in my Volvo. I still don’t know how it happened in the rental. I am not mindful of actually choosing to lock the car. So that’s how I found myself at a Chevron station in Northridge, without my phone or wallet (they were both locked in the car). I checked for money in my pocket and came up empty. “You really are a loser,” my sister laughed when I told her this story. I explained my situation to the clerk in the gas station mini-mart and asked if I could borrow his phone. …only to be told I needed to call a different number for roadside assistance. My gas station Samaritan needed to get back on the road, but he pointed to a dental office in the building next door and suggested that someone there might let me use a landline. I didn’t have any better options, so I walked in to the dental office, told my tale of woe to the receptionist, and voila! She dialed the number for me. I was on hold. I eventually got to talk to someone, and then I was on hold again, while she made arrangements for a locksmith to help me back into my locked-up rental car. All this time, I stood in the dental reception area, while the receptionist handled phone calls and appointments from another handset. All in all, I was in that dental office for about a half hour and then waited another half hour for the locksmith, who advised me that I would have been better off ignoring the tire pressure light on the rental car. It was now 2:26 on the dashboard clock. There was no time to grab lunch – just enough to pick up a couple of cold drinks for Megan and me before I picked her up from school. I drove up a block to Starbucks, ordered some ice tea and purchased a gift card for that receptionist who let me use her phone. I imagine her first thoughts upon seeing me back were “What now?” But she looked genuinely surprised – and pleased – when I handed her the card. I told her she saved my life. And while that may be hyperbole, at that moment, that’s how I felt. And a little less like a loser. Happy Birthday! I love that you went back and thanked her. You made her day!